Now I’m fine with “Merry Christmas”. I have nothing against saying “Merry Christmas” and I will wish everyone out there a “Merry Christmas”. 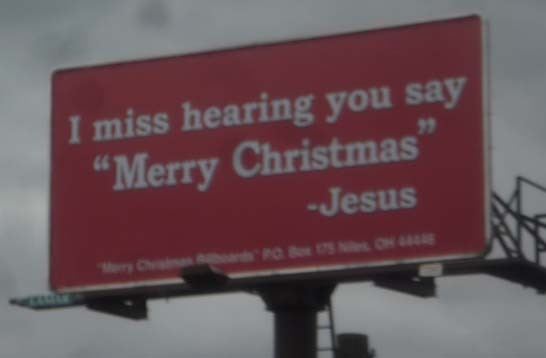 But the idea that Jesus actually said something like “I miss hearing you say ‘Merry Christmas'” had me almost choking on my coffee laughing. Why? Because Christmas was originally a pagan holiday until the Romans declared it a religious holiday. The thinking went that no one would celebrate it if they tried to hold it on a different date. So why not work some religion into an already existing holiday? I wonder if the billboard designers think that the Christmas tree came from the bible (Hint: it was a pagan ritual). It also struck me as funny trying to think about which chapter of the bible Jesus would have said this in. Probably the Book of John as his narrative leaned towards the most “imaginative” anyways. Of course, Jesus never said any such thing. It just strikes me as funny that they’re putting words in Jesus’ mouth. Doesn’t this go against one of the commandments? Something about worshiping false idols or wrongful use of the Lord’s name? 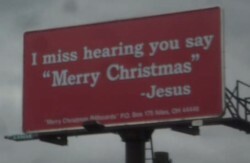 I guess the billboard authors see themselves as some kind of holy warriors in this so-called “war against Christmas”. As a card carrying liberal, I’m happy to say that Christmas never comes up at the meetings. There are simply other things that are much more important. In fact, I don’t know anyone who minds “Merry Christmas.” Not my Jewish friends. Not my Muslim friends. Not my Hindu friends. Not my Japanese friends. There are, however, a couple of things that worry me about these billboards as a liberal. One, the amount of fear that has been drummed into some right-wing Christians. Why is this a concern? Groups that feel they are under attack are capable of using this fear to justify just about any action against another group. In general, liberals do not object to Christianity and are, quite the contrary, big defenders of freedom of religion. But if you talk to many right-wing Christians, you’d think we were the anti-Christ. I never realized where this came from until I tuned into right-wing radio which pumps a daily dose of fear and hate out over the airwaves (Is there any irony here that some of the people purveying this hatred are self-proclaimed Christians?). Second, God does not scare me. But the people who think God is talking to them do. Because when you start hearing voices, who knows what the voices might say? No one hates you and there is no “vast liberal conspiracy” against you. Please feel free to worship in any way you would like this holiday season. I’m thinking about these things this Christmas. And I’m not Christian. It’s my Christmas wish that we all remember some of these messages when people on the radio or TV are telling us to hate liberals or hate conservatives. We are all people though we may sometimes disagree. Here is a message you will not hear on talk radio because this type of message does not generate controversy or increase ratings. Yet it’s this message I’m sending you this Christmas season. All the Best in 2010 and Merry Christmas! Figured I’d use the same name as I use over at Chris Wiegant’s site. I felt a piece this good deserved a comment, and was a bit surprised to actually see none, so here I am, even if it is late. Well said. I’m a conservative, but one of the things I really dislike in the Republican party today is the undue influence of the right wing religious folk. Not because there’s anything wrong with the idea of faith, or Christianity specifically, but because they, as you say, preach a lesson of hate and let this affect policy decisions on things like abortion or gay rights. I don’t want a society built on hate. Nobody is saying Christians have to like things like homosexuality or abortion, nobody says they have to encourage them or think of them as good. What I think does need to be said is that theirs is a faith, as you point out, of tolerance and love for others. It is not (and in fact it says as much) a faith based on judging others. That’s for God to do, according to Christianity (and many other faiths, for that matter). Why not leave it to God to judge others? I actually don’t have a problem with people who think God speaks to them. So long as they don’t use that to justify hatred of others, because I doubt any benevolent God wants us to hate one another. If they hear God speak to them and that inspires them to open hospitals, or help the homeless, that can only be a good thing, but if they hear God saying “Kill all the gays” then they have to question whether a loving God would say that. Equally as an agnostic (though born into the Sikh faith) I’ve got no problem with “merry Christmas”, I say it all the time. I love Christmas, even though I’m not Christian, because the idea of loving other people and coming together as families and friends is a hard one not to love (we also don’t have thanksgiving over here, so Christmas provides the only winter “get together”). So incredibly belatedly, Merry Christmas. I hope it was a good one for you and your family. Indeed it was a great Christmas and a belated Merry Christmas back at you!